125 grams dark raisins ( = 1 cup, packed). I definitely prefer Thompson raisins to Sultanas. Which apple variety to use? The apples should have lots of flavor, not be too sweet, and not fall apart when baked. Examples: Cox Orange (classic! ), Elstar (light sour note, flavorful), Jonagold (sweet-sour), Boskoop, Gravenstein, Granny Smith. Also: Idared (sweet), and even Braebrun (firm). See photos below. I often use Jonagold. Optional: 2 tablespoons of dark rum. A pastry cutter - very handy! Put the flour in a large bowl and loosen up with a wire whisk. This also gets the clumps out, if any. The purpose is to create evenly sized pieces of butter, coated with flour, and evenly distributed throughout. Pre-cut the butter into a dozen or so pieces, add to the flour mix and cover with flour. Use a pastry blender (or two large knives) to cut the butter into the flour, until the pieces are about pea-sized. Add 1/3 of the beaten eggs. Knead by hand into a homogenous dough. Keep your hands cool by running cold water on them once in a while. Further divide the latter 2/3 into 1/3 (for the top) and 2/3 (for the bottom). Wrap the 1/3 dough for the pie-top in plastic kitchen film. Separate the bottom and ring of the springform pan, and grease both with some butter. Form the dough for the pie-bottom into a ball. On a lightly flour-dusted surface, roll out the dough ball with a flour-dusted rolling pin until it is about the size of the bottom of the pan. Then transfer the dough to the bottom of the pan, and even-out the dough (important!) with your thumbs and/or a large spoon. Alternatively, you can break up the dough into pieces and simply paste them onto the bottom of the springform pan, then even out the dough layer. Form the dough for the pie-side into a long, even bar (about 80 cm long, ≈2.5 ft; it is OK to have several pieces). On a lightly flour-dusted surface, roll out the dough bar with a flour-dusted rolling pin until it is about 4 cm wide (about the width of two index fingers). Line the inside of the springform ring with the flattened dough bar (or bar pieces). Make sure that the dough has en even thickness, all the way around. Make sure to close the seam between the dough on the bottom and the dough on the side. Put the springform pan in the refrigerator. In a small bowl, soak the raisins in hot water. If the almond paste is hard ( = old), you can soften it up by zapping it 20-30 sec in the microwave oven. Add a tablespoon of milk or cream and rose water. With a very sturdy fork, work the egg and milk/cream/rose water into the almond paste. Continue working the paste and adding milk/cream/rose water until the paste is thin enough to be able to spread it with a spoon. Cut the apple quarters lengthwise into several thick slices (3-4 for an average size apple). Put the apple pieces into a large bowl and add the lemon juice, cinnamon, and slivered almonds. Drain the raisins, pat dry, and add to the apple mix. With two large spoons, fold over the apple mix until the apple pieces are well covered with juice and cinnamon, and the raisins are evenly distributed. Optional: mix in the rum (or drink it). Spread the breadcrumbs over the dough bottom in the springform pan. 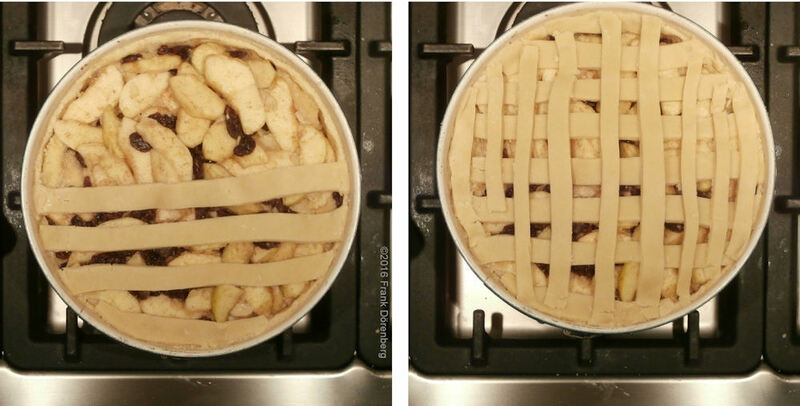 Fill the springform pan with half of the apple mix, and spread out evenly. Spread the almond paste over the apple filling. Use a spoon to put dabs of paste on top of the apples, then (try and) spread with the spoon. Put the rest of the apple mix on top, and spread out evenly. With your hands (not you finger tips! ), push down firmly on the apple mix. Take the dough that was set aside for the top of the pie, cut it in halves, and form into balls. On a lightly flour-dusted surface, roll out dough ball with a flour-dusted rolling pin until it is about 3 mm (1/8 inch) thick, and as long as the diameter of the springform pan. With a sharp knife, cut into strips that are about 1 cm (1/2 inch) wide. Take one dough-strip and drape it on top of the apple mix, diagonally across the middle of the pan. Cut two additional one-piece (!) strips and place them to the left & right of the first strip, at a distance that is the same as the width of the dough strips. Repeat until the top of the pie is covered. Make sure that the seams between the ends of the dough strips and the dough on the side of the pan are closed (use your fingers). Repeat with the second dough ball, but put the dough strips at a right angle across the first strips. Bake in the bottom third of the oven (turn the circulation fan off) for 80 minutes – the top should be dark golden. 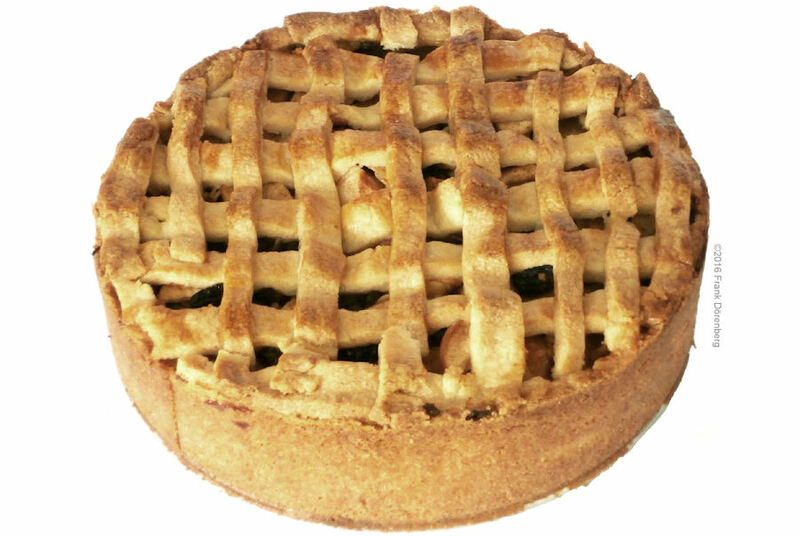 This is a moist, dense type of pie. And heavy: before baking, the springform pan with the pie weighs about 2.6 kg (≈5.5 lbs). Freezes well - thaw out completely ( = transfer from the freezer to the refrigerator a day before using it, then remove from the fridge several hours before serving). Heat up in a in 175 °C (350 °F) oven. Adapted from a 2015 recipe by Frances; ©2016 F. Dörenberg, unless stated otherwise. All rights reserved worldwide., unless stated otherwise. All rights reserved worldwide. No part of this publication may be used without permission from the author.